From 2017’s articles here on the site, we’ve got the Coot dinghy on the cover, a nice selection of sail, motor, paddle, and oar articles, a guide to kits and boatbuilders, and an inspiring collection of Reader-Built Boats and their stories. A few years ago, the Oselvar boat was named Norway’s national boat and the design serves as an icon of the country’s deeply rooted maritime traditions. Vidar has filmed an informative video about the boats and the workshop. 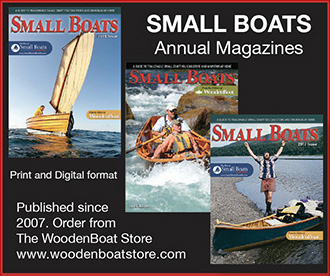 With winter coming on, it’s a good time to retreat to the shop for a boatbuilding project. By spring you could have a Drake Raceboat ready to row. You can now order plans or kits from Chase Small Craft. Our Fearless Editor, Chris Cunningham, has traveled to this gathering in the past, and we plan to re-establish our connection with this fantastic gathering in 2018. A workshop? A beer social? We’re not sure yet, but get excited. Here are some photos from 2017 to get you ready for next year. Maggie MacDonnell, a teacher in Salluit, Canada, who recently won a $1 million prize for her contributions to education, and, in particular, to the Inuit community there, is channeling that fortune into connecting the rest of the world with kayaking and other aspects of Inuit culture. The Squadron is shipping their own fleet of historical 18-foot skiffs from Australia to Annapolis specifically for this event. They will also race their boats in the 8th Annual Classic Wooden Sailboat Rendezvous & Race on September 16-17. A Facebook user riding down the Highway 90 the other day took this video of a long line of small boats being trailered into Houston to help with rescue efforts. Building a Marshallese-style canoe during a summer program connected students with better English skills and with their own seafaring culture. Someone digitized the whole darn thing, and you can now access it everywhere. Have you used the Ashley Book of Knots to complete projects aboard, add a Bristol touch to your boat, or to learn the basics? Behold: The British Library’s collection of Ships & Boats, copyright free on Flickr. Among the fully rigged ships you’ll find great examples of vernacular small boats in use, with snippets of text around them that give clues about the action in the scenes.